Privately run prisons including Forest Bank in Salford, Manchester and Altcourse jail in Merseyside, have won praise for their good performance. A report by the National Audit Office (NAO) says the jails, paid for by private money, have brought benefits to the whole of the prison system. The report commends the Private Finance Initiative (PFI) prisons, saying they can provide examples of good practice for publicly funded jails, although it admits there is still room for improvement. 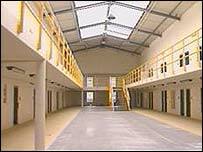 Seven of the 137 operational prisons in the UK are privately financed. The report's author Phil Airey looked at the prisons which were set up under the controversial PFI funding. These include: Altcourse, Ashfield, Dovegate, Forest Bank, Lowdham Grange, Parc and Ryehill. They account for 7% of the prison population - around 5,000 prisoners. Taking part in competitions over the operation of prisons has helped improve performance in PFI jails, according to the report. It also says staff prisoner relationships in privately managed prisons have helped the drive to improve decency in publicly managed prisons. PFI prisons tend to perform better than public prisons in areas related to decency and the activities of prisoners, but less well in areas such as safety and security, it adds. Mr Airey said: "Certainly PFI prisons do well in the way they treat prisoners in their care and do well in providing purposeful activities for those prisoners." But he said assaults between prisoners and other areas of safety and security needed improving. The head of the NAO Sir John Bourne, said: "The experience of the prisons sector shows that the use of the PFI is neither a guarantee of success nor the cause of inevitable failure. "But what is clear is that competition has helped drive up standards and improve efficiency across the prison system as a whole." But the PFI prisons do not win universal favour. Unison opened its annual conference in Brighton on Tuesday with a debate expressing the union's opposition to the private finance initiative (PFI) and other forms of privatisation in the public sector.